Review: I am woefully late with this review. I finished reading it quite a while ago and am having to write this review from what lingers, more than a month later. The novel alternates between Jeremy Best, a trusts and estates attorney who writes poetry under a pen name, and Spaulding Simonson, a 19-year old aspiring writer fresh from a stint in a mental hospital, as a friendship develops between them. 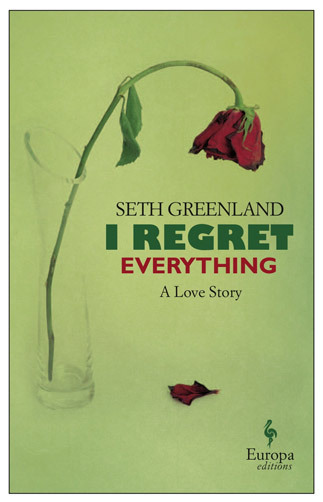 In the span of about 250 pages, Greenland tackles unlikely love, work versus vocation, poetry, mortality, and the complicated tangle of family in a quirky, bright, and occasionally snarky manner. Jeremy wants to write but he's also very good at his job. When the pretty and appealingly odd Spaulding -- daughter of his boss -- shows up in his doorway, his natural inclination is to put her off. But Spaulding -- who has been put off by everyone in her life -- is determined to get Jeremy's attention, especially when she discovers he's a well-regarded poet. I will admit, when it became clear there was to be a romance between our 30-something hero and the 19-year old heroine, I initially couldn't stop a Liz Lemon-esque eye roll and "Oh, brother!". But once I got that out of my system, I found I didn't mind the burgeoning, awkward will-they-won't-they; both Jeremy and Spaulding were flawed creatures and faced intriguing obstacles, both of their own invention and from the people around them. A fast read, accessible and fun, and perfect for the summer. A little knowing, a little sad, a lovely mix of literary and fluffy. For those new to Europa Editions, this is a great introduction to the kind of sophisticated, compelling stuff they release. I almost snagged this one when offered to me but declined based on the cover! It just doesn't do it for me. I know, the cover is super underwhelming. As a rule, I'm not wild about Europa Edition covers, actually. I know! I hate it when that happens -- I do that too often -- as I said to Ti, this one doesn't do the book justice.